Join our satisfied clients who rely on cutting edge, no cost invoicing software platform to create efficiency from billings to collections. Try it today! Could you use more time to focus on generating new revenue for your business? Simple online billing processes allow you to complete invoicing quickly. Looking for an easier way to keep up with all the out of pocket expenses? User friendly expense capture screens help ensure you never miss a billable expense. Bidding on a new customer project or account? Intuitive estimating solutions allow you to create professional proposals that help close those new deals! Want to make sure every account gets great service? Stay on top of every customer account from new opportunities to outstanding receivable balances. Tired of wasting your time sending payment reminders to customers? Just a simple configuration of our solution allows us to do that work for you! Interested in having the right information at your fingertips to gain critical insights? Know overall business performance, top customers, top products, and more! Ready to stop dealing with cumbersome time tracking spreadsheets? Enter your billable project time with just a few clicks and entries. It’s that easy! Need a more efficient invoice collection process? Our best in class online payment gateway access means you get paid faster than ever before. Doing business internationally? No problem. Invoices Unlimited enables billing and collection in any currency used across the globe! 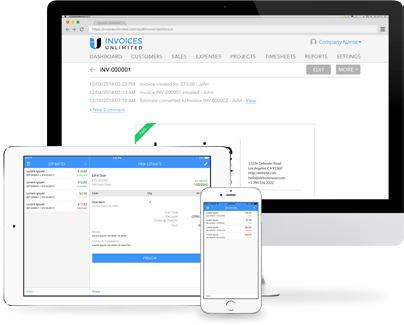 Take Invoices Unlimited Everywhere You Go! With our fully functional applications, nothing stops you from sending invoices, creating proposals, or tracking your business performance from the convenience of any desktop or iOS device with a connection. That’s right…manage your business……anytime……anywhere! You have full access to our easy to implement and fully supported suite of invoicing software functionality. We can have you implemented in no time and achieving faster cash flow turnaround than ever before. Join our platform and experience the organizational effectiveness of large businesses with big infrastructure budgets at a small fraction of the cost charged by competitive solutions. Stop waiting for checks in the mail. With one easy click your customers can pay their invoices online with any major credit card. Get funds in your account within hours, not weeks. 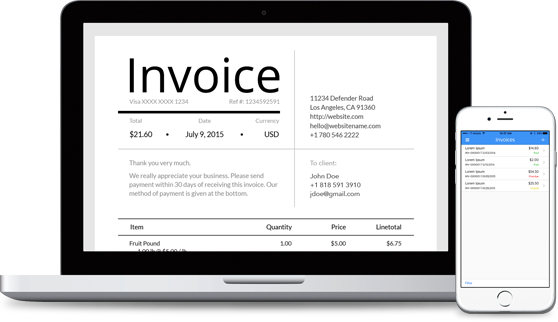 Using the best invoice software available is an important part of managing a business. Without a user-friendly program, even the simplest tasks, such as communicating with clients and employees, can become challenging. Continue reading to find out how this program can make business management easier. As you run your company, you need to be able to communicate with those people who you provide goods or services for. The first step of communication might be creating a proposal for a project. The estimate tool helps you create easy-to-read, accurate proposals. You can list taxes, material costs and labor fees on separate lines to give clients a clear idea of where their money would go. After a project has been finished or a good has been provided, the communication needs to continue. You can easily turn an estimate into an invoice. After a certain amount of time has lapsed without payment, you can send out automatic bill reminders to help ensure your customers do not forget to pay. As your relationship progresses, you can use the customer profile to keep track of contact information and client needs. The notes you and your employees keep in this profile may help you better serve the customer. While customer management software is an important part of managing a business, you may need more tools in order to be effective. Having a familiarity with the best products, biggest expenses, top customers and overall business performance can help you make the big decisions for your company. For example, if you need to cut back on expenditures, clear, informative reports covering your organization’s top expenses may help you figure out exactly where you can spend a little less. Reports can help you communicate your goals to employees or successes to investors. However, if you do not have the software to translate your sales, billable hours and expenses to reader-friendly reports, it might be challenging to really get your point across. Invoicing software can improve many aspects of business management. © 2016 Invoices Unlimited. All rights reserved.